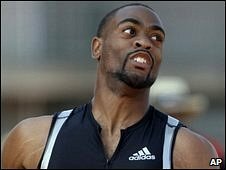 American Tyson Gay says he can challenge Usain Bolt's 100m world record after a wind-assisted 9.75 seconds in his first race of the year. Bolt ran 100m in 9.69 seconds to set the record at the Beijing Olympics. However, when asked if he could beat Bolt's mark, Gay replied: "Pretty much... when I become more technically sound out of the blocks." "You have got to run 9.59 to beat him, that's how I look at it, I have the mechanics. I have the coaching." The pair are unlikely to face each other until August's World Championships, where both are scheduled to run the 100 and 200m. "I'm looking forward to a fast race," said Gay of their highly anticipated Berlin showdown. Jamaican Bolt has already shown his form this season and ran the 100m in 9.77 seconds at the IAAF Golden Spike meeting in Ostrava earlier in June. "I ran a wind-aided 9.7. He ran a wind-aided 9.7. We are both showing great fitness," said Gay whose fastest mark was a wind-assisted 9.68 at the 2008 US Olympic trials. Gay, whose best time without a beneficial breeze is his American record 9.77 seconds, was expected to challenge Bolt in Beijing. However, the sprinter went into the Olympics carrying a hamstring injury and did not qualify for the Olympic final after finishing fifth in his semi-final. What makes Usain Bolt tick?